Singles’ Day has become the world’s biggest online sales event and last year netted Alibaba 168 billion yuan, about $24.15 billion in total sales. You probably have heard of Black Friday sales being promoted by some e-commerce giants in Nigeria. But whatever it gets called, it is a period you can get large inventories on discounts. In China, a version of Black Friday is called Singles Day and it started on Sunday, November 11th. 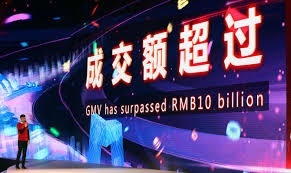 It is spearheaded by Chinese e-commerce giant Alibaba Group Holding Ltd. What's interesting is that within the first hour that it started, the company settled roughly 69 billion yuan, about $9.92 billion. When you convert that into naira, it is more than 3 trillion naira, realized in just one hour. Alibaba kicked off the annual event with a gala, which this year featured U.S. singer Mariah Carey, a Japanese Beyonce impersonator and a shoe-shopping-themed Cirque du Soleil performance. It’s expected to be the company’s final November sale event with founder and chairman Jack Ma at the helm, according to a Reuters report. Current chief executive Daniel Zhang will take over as chairman next year, the company said in September.